This twelve year old Cocker spaniel is presented to you with an eye that is irritating her. What sign in this image confirms this and what might be the cause? The protrusion of the third eyelid suggests that there is some globe retraction asociated with the discomfort. 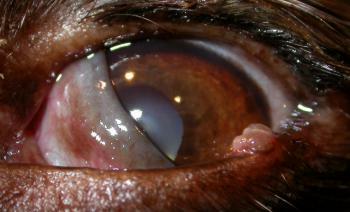 The eyelid tumour – an adenoma – doesn’t seen to be causing any irritation until you evert the lid as here, and see that it does have a much larger mass rubbing on the cornea than might be evidence initially. The moral of the story is that such masses should be removed when small, not causing any problems and are easily removed with a simple wedge resection. 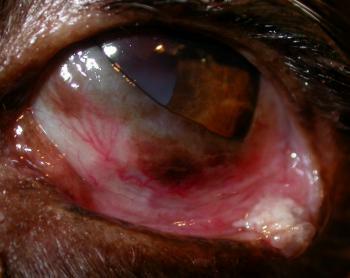 This entry was posted in Cases and tagged dog, eyelid tumour. Bookmark the permalink.